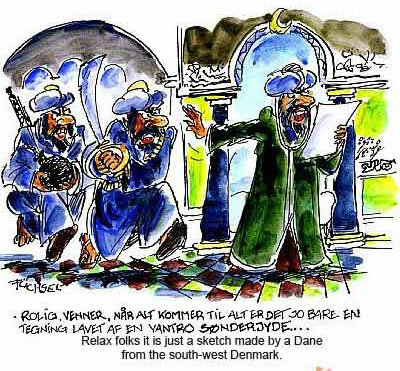 These are the 12 cartoons printed in the Danish paper Jyllands-Posten, one of two major newspapers printed in Denmark, on September 30, 2005. Why did the editor of JP decide to publish the cartoons? In actuality they where solicited by the editor after he heard a story of Danish illustrators refusing to do artwork for a children's book about Muhammad. The artists had refused to do the work because they feared reprisals. Their fears were based on the murder of the Dutch filmmaker Theo von Gogh. Von Gogh had produced a film critical of Muslim attitudes towards women. Twelve illustrators responded to JP's request. The cartoons were printed along with an article explaining the self-censorship story. In the past Danish artists have produced provocative art that would be found offensive by Christians. The most recent example was a painting of Jesus with an erection. Strange, that rioting Christians have not been seen burning down Danish embassies.